This lesson may be completed in whole or in part, depending on the needs of your students and the time that you have. In what ways is equality a proposition, or belief, worth fighting for? Students will consider whether equality is important to our democracy as they develop a deep understanding of the literary and historical value of the Gettysburg Address through a game-based close reading of the text. 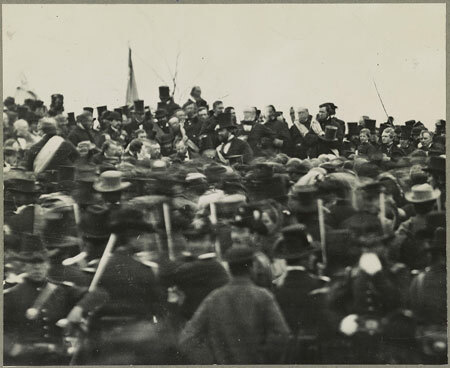 Analyze primary sources to spark inquiry into the Battle of Gettysburg and President Abraham Lincoln’s address at the dedication of the Gettysburg Cemetery. Complete a close read of the Gettysburg Address to understand vocabulary, word choices and text references, use of rhetorical devices and text structures, as well as Lincoln’s purpose for the speech and his call to action. Discuss the focus question in light of historical and contemporary contexts. In addition to the information found in Gettysburg Battle Basics, educators may wish to review the resources linked to below. Decide which activities you will have time to complete with students. Review lesson implementation and prepare all lesson materials. If your students are not familiar with primary source analysis, you should model this activity using the primary source analysis tool before implementing this lesson. Prepare digital or print images (see Using Sources: Printing High Quality Black & White Primary Source Images). If printing the primary source images, consider using plastic sheet protectors to prolong the durability of the images. If students are not familiar with text structures, you will need to pre-teach this or leave it out of the lesson. Display the lesson presentation. Slide 1: Ask students to share a few thoughts about the meaning of the focus question: Is equality a proposition, or belief, worth fighting for? Jot down a few key student ideas, as well as any questions that they may have, in a digital document, on the board, or on chart paper. Tell students to write their names in the top right corner of the Primary Source Analysis Tool and then turn it over. Slide 2: Ask students to think about what they know about Abraham Lincoln. Slide 3: Tell students to take 1 minute to write as many facts as they can think of on the back of the Primary Source Analysis Tool. Take 1-2 minutes to have students share the facts they knew about Lincoln (e.g., he is on the penny coin, he is on the $5 bill, he wore a top hat, he was President of the United States, he gave a famous speech, etc. ), telling students when a fact is correct and is eligible to count towards points total. Slide 4: Tell students to add up the points they received and to write that number on their paper and circle it. (You may wish to allow students to add these points to their Gettysburg Game On point totals). Display the digital image of President Lincoln and Gen. George B. McClellan and inform students that, together, the class will be completing a primary source analysis of this image to see what more they can learn about Abraham Lincoln and the time when he was President of the United States. Call on students to share their observations, reflections, and questions and note key responses and questions in a digital document, on the board, or on chart paper. Review the bibliographic record to get additional information. Add new findings and questions to the lesson notes. 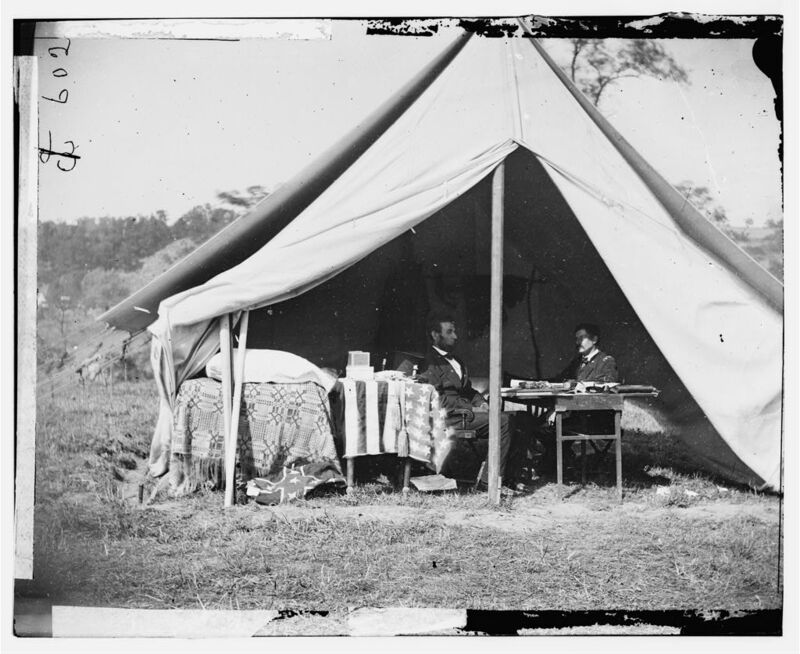 Narrate several slides to give students some basic background to the Battle of Gettysburg and to see if any of this information provides answers to questions they posed during the primary source analysis. Slide 5: Abraham Lincoln was president of the United States during the Civil War, which began in April, 1861, one month after he became president, and lasted until April, 1865, just days after his death. Slide 6: The U.S. Civil War was fought between the Union [blue areas], which was fighting to keep all of the states together, and the Confederacy [grey areas], which was fighting to leave the Union. Slide 7: The battle of Gettysburg, which lasted from July 1-3, 1863, is considered by many to be the turning point of the Civil War. Slide 8: Gen. George G. Meade led the Union soldiers. Slide 9: Gen. Robert E. Lee led the Confederate soldiers. Slide 10: The Union won the battle at Gettysburg but the human price was terrible: 28,063 Confederate soldiers and 23,049 Union soldiers were killed or wounded. Slide 11: Every farm field and garden was a graveyard. Slide 12: People in Gettysburg were concerned about the poor condition of graves at the battlefield and hospital sites. Slide 13: A year earlier, on July 17, 1862, President Lincoln signed legislation that gave the the U.S. government the power to create national cemeteries. Slide 14: Gettysburg lawyer David Wills organized the creation of a “Soldiers’ National Cemetery”; Union dead began to arrive at this new cemetery in the fall of 1863. Display the image (slide 16) and, if possible, provide students with printouts or access to the digital image. Direct students to work individually or with a partner to analyze the source, with each filling out a primary source analysis tool. Review student analyses as a class to uncover student learnings and questions related to the Gettysburg Address. Add any new findings and questions to the lesson notes. Give each student a copy of the numbered transcription of Lincoln’s Gettysburg Address and direct them to write their names on it. As a class, reflect on the speech. Did any words stick out to you? What were you thinking and feeling as you listened to the speech? What part of the speech did you find especially interesting or appealing? Why? How do you think this speech might relate to our focus question: In what ways is equality a proposition, or belief, worth fighting for? Jot down key student findings and questions in the lesson notes. Instruct students to keep the speech transcription for the next part of the lesson. Inform students that, in the next part of the lesson, they will be competing to see who will be identified as text novices (beginners), who will level up to text boss, and who will become text masters. Collect students’ completed primary source analysis tool/Lincoln facts sheets to assess student background knowledge and analysis skills. If you did not assign the optional vocabulary homework prior to starting the lesson, you may choose to assign it now (you could make the homework optional for students and those who complete it will have a leg up on the competition in Part II). Before beginning, make sure that each student has a Gettysburg Address Game Tracker at his/her work space. Tell students to take out their numbered transcription of the Gettysburg Address and inform them that they will use the game tracker to note the points they earn as they complete a number of tasks (slide 20). Divide students into groups 6 groups and give each group one section from the Word Whiz definitions and translations document. Instruct students (or a student) to read the instructions (slide 17). Your group has definitions of some words from a part of the Gettysburg Address. Your job is to review the words and their definitions and use them to help you re-write the text in your own words. Give student groups 5 minutes to complete this part of the activity; you may choose to award extra time if students seem to need it. When students are finished, read the text from section 1 and then ask the group with that text to have one member read aloud their rewrite of the text. You may choose to award points yourself or allow students to vote on the point award (1 point for a satisfactory translation, 2 points for good, and 3 points for excellent). Continue until each group has shared their text translation and received their points. Tell students (slide 18) that Lincoln’s speech took just under 2 minutes to deliver and contained around 270 words, but only 220 words if you remove articles such as the and a; conjunctions such as and, but, and or; and prepositions like to, for, and of. As a great speech writer, Lincoln used repetition to emphasize ideas and make points. We are going to use a word cloud to help us recognize four of the words Lincoln repeated most often in the Gettysburg address. Display the word cloud of Lincoln’s Gettysburg Address (slide 19) and inform students that words used more often in the text will be bigger in a word cloud and towards the center. Ask: Which words do you think Lincoln used most often in his speech? Instruct student groups to take 1 minute to look at the word cloud and, if they like, to glance at the speech transcription, and write down the 4 words that they think were repeated at least 5 times in the speech. Tell students the words and number of times they were repeated (slide 20) and that each word correctly identified earns 1 point for each group member. Direct students to take 2 minutes to underline those words on their speech transcripts; award 1 point to each group that is on task. Display slide 21 and ask students to take another minute to highlight each underlined word with a different color as shown. Ask students why they think Lincoln chose to repeat those words. Note valid student responses, awarding 1 point for each response noted. Review the following with students, noting highlighted phrases (slide 22) and indicating, when appropriate, how these coincide with student responses. We to stress unity. We are all part of this nation. Here to emphasize where they are (at the cemetery on the site of the battlefield) and the importance of the sacrifice (dying) these men made to the Union. Dedicated to emphasize that our nation was founded on the principle that all men are created equal, as stated in the Declaration of Independence, and that we need to be as dedicated as those who gave their lives to preserve not just the union but the nation. Nation: Lincoln points to the nation’s beginnings; reminds us that it is in peril but can (and should) be reborn. Ask groups to share their sentences. You may choose to award points yourself or allow students to vote on the point award (1 point for satisfactory, 2 points for good, and 3 points for excellent). Give each group a Telltale Techniques worksheet or tell them to write their answers for this “game” on a sheet of paper. Tell students that writers use a variety of techniques to call attention to and reinforce ideas (slide 24). Two of these rhetorical devices are contrasts—putting two opposite ideas in one thought—and triads—repeating three related thoughts, usually using similar grammatical constructions. Provide examples of contrasts (slide 25) and triads (slide 26). Instruct student groups to work together to try to uncover instances of contrasts and triads in the Gettysburg Address. Tell students they have 5 minutes to write their down their findings; encourage groups members to divide the work up by looking at different sections. Direct students to tally their points (7 pts possible). Give each group an ID It worksheet or tell them to write their answers for this “game” on a sheet of paper. Tell students to look at their copy of the numbered transcription of the Gettysburg Address. Ask student groups to take a couple of minutes to review the speech again to see if they can determine how the text is structured (slide 27). Ask a student representative to provide their group’s answer (correct identification earns 1 point for each group member). Once chronological order (past, present, future), has been identified (slide 28), tell student groups to take a few minutes to mark the parts of the text that belong to each (past – section 1; present – sections 2-5; future – sections 6-10; slides 29-31). Students earn 1 point for each part (past, present, future) correctly matched with the appropriate sections. Ask student groups if they can identify the year Lincoln was referring to in the past section (slide 32 – 1776: 1 point); which word (slide 33 – Liberty: 1 point) and which phrase (all men are created equal: 1 point) relates to what famous historical U.S. document (slide 34 – Declaration of Independence: 1 point). Discuss with students how this knowledge relates to the beginning of the present part (section 2, slide 35). Inform students that at the beginning of 1863, on January 1, President Lincoln issued the Emancipation Proclamation (slide 36), declaring that all slaves in the Confederate states free. Remind students that Lincoln brought up equality in the beginning of the speech. Define a call to action (slide 37). Ask student groups to identify the call to action Lincoln makes at the end of the Gettysburg Address (answer slide 38); award students points based on their responses. Instruct student groups to discuss how they think Lincoln would respond to the lesson’s focus question—In what ways is equality a proposition, or belief, worth fighting for?—based on what he wrote in the Gettysburg Address. Share group findings with the class. Ask students to provide a written response to the focus question in the context of their own lives. If you would like your students to learn a bit more about the Battle of Gettysburg, you may begin the lesson with one of the following activities in place of simply providing background information on the battle. Divides students into 6 groups and give each a Gettysburg Source Review to complete. Discuss student findings then proceed to background information about the aftermath of the battle found in the lesson presentation. Divide students into 6 groups to analyze a primary source. Give each group a Gettysburg Battle map or image and a primary source analysis tool. Display primary sources and have a group representative share group learnings and questions with the class. Map of the Battle of Gettysburg, Penna. Give each group one of the three Today in History excerpts and ask them to summarize what they learned and to share that information with the class. Have students complete the Learning from the Source lesson: Where do I run to? Where do I hide? After learning about the Battle of Gettysburg, you may have students play the game described below. Divide students into groups of 4-5 students. Hand out pages from David Wills letter, inviting President Lincoln to speak at Gettysburg, along with cut outs of the invitation transcription sentences and challenge students to piece the invite together. The first team to correctly piece together the invitation wins. Have students complete the Gettysburg Address Image Sequencing activity. Ask students to develop a creative work (painting, poster, diorama, song, poem, print or digital story, etc.) that includes repetition, contrasts, and triads and demonstrates their response to the lesson’s focus question: In what ways is equality a proposition, or belief, worth fighting for?